If you're a pet owner, you've probably noticed that transporting your dog or cat may present special challenges. However, some SUV models are perfect for pet lovers. When shopping for an SUV, most people make a list of their own priorities, often including things like fuel economy, performance, and reliability. But if you frequently travel with your pets, you may need to add a few other characteristics to this list. What makes an SUV pet-friendly? The SUV needs to have enough room to comfortably transport your pets. If you have one dog, this may not be a significant concern. 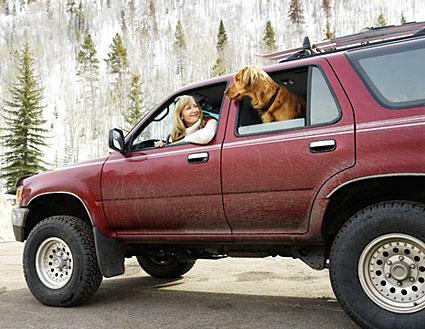 However, if you have several big dogs, you'll need a vehicle with a lot of cargo space. Similarly, if you routinely need to transport several cat carriers to the vet, you'll need enough room to keep everyone comfortable. The vehicle must be durable enough to withstand the abuse pets can dish out. Dog toenails can wreak havoc on leather upholstery, but muddy paws can also take their toll on light-colored fabric. A pet-friendly SUV should have a rear gate that's low enough for pets to easily get in and out. This is especially important if you have an older dog, since jumping can be hard on the hips. You may want to modify your new SUV to accommodate certain pet products or supplies. Whether you need to add a kennel grate to the cargo area or want to install storage for leashes and other items, make sure the vehicle you're considering can accommodate these modifications. Many owners insist that the best SUVs for pets have seats that can fold flat when not in use by human passengers. This gives dogs more room to lie down. Pet safety is another important consideration for many owners. Generally, the safest SUVs for humans are also the safest for pets, but it's also a good idea to make sure you have enough connections for pet safety harnesses. Although Honda discontinued production of the Honda Element in 2011, it was beloved by dog owners and is still a popular choice as a used car. The Element's large cargo area is lined in durable urethane, so it's easy to clean up pet messes. The upholstery fabric is stain-resistant as well. The Element has four doors, but the rear doors open out French-door style. This allows plenty of room to load cat carriers or large dogs from the side of the vehicle. Although it is one of the most expensive SUVs on the market, the Range Rover is an ideal choice for pet owners. If your budget isn't quite up to a new Range Rover, consider a used model. The Range Rover's durable upholstery and carpeting are designed for hard use, so they are perfect for pets. The comfort features are also a plus: climate control and a smooth ride keeps pets comfy on long trips. The GMC Yukon XL is another favorite among pet owners. One reason for its popularity is that the seats can easily be arranged in several different ways to accommodate bulky pet crates or dog beds. The Yukon XL also has more cargo room than most other vehicles in its class, and it has side curtain air bags in all three rows to help protect your furry friends in the event of an accident. 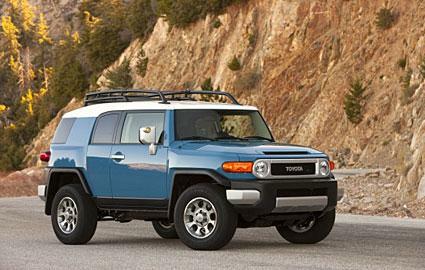 Among pet owners, another popular SUV is the Toyota FJ Cruiser. With a rubber-lined cargo compartment and water-resistant seats, the surfaces in this car are ready to handle even the biggest dogs. It also features a wide rear gate to make it easy to load large kennels, and it has French-door style side doors to facilitate loading from the side as well. A new FJ Cruiser is fairly affordable, and used models are even more budget-friendly. Before you select the SUV that's best for you and your pets, it's a good idea to test drive the vehicles on your list. Although most dealerships won't allow animals to ride along on a test drive, you could bring any large dog kennels or other items to see how the vehicle accommodates them. Additionally, you may want to bring a notebook to record the various pet-friendly options on each SUV model. That way, when you get home, you can compare SUVs and select an SUV that will be perfect for your needs.